At the John F. Kennedy Presidential Library, collections are frequently processed years before digital images and related metadata are available online. Typically, multiple archivists handle materials as they move through the processing, cataloging, and digitization steps. In a trial experiment, I was responsible for all three of these stages in addition to creating a finding aid for the Margaret Ronayne Hahn Personal Papers. The goal of this project was to determine if a new combined method was one that could be applied to future collections. Before starting this project I consulted the processing manual to familiarize myself with the guidelines and procedures that the John F. Kennedy Presidential Library and its parent institution, the National Archives and Records Administration (NARA), have in place. I then worked on a processing plan, consulting an initial inventory, checking the deed status and potential restrictions imposed by the donor, and surveying the extent of the collection. I created a basic structure for textual folders in Documentum, the digital asset management system (DAMS) at the Kennedy Library. As I scanned documents, digital files were stored in Documentum according to their digital identifiers. In retrospect, scanning the collection before arranging it was probably a bit premature. The digital identifiers and order of the folders changed repeatedly as I moved things around and probably created more work than I needed to. I was surprised to find how challenging arranging series could be. 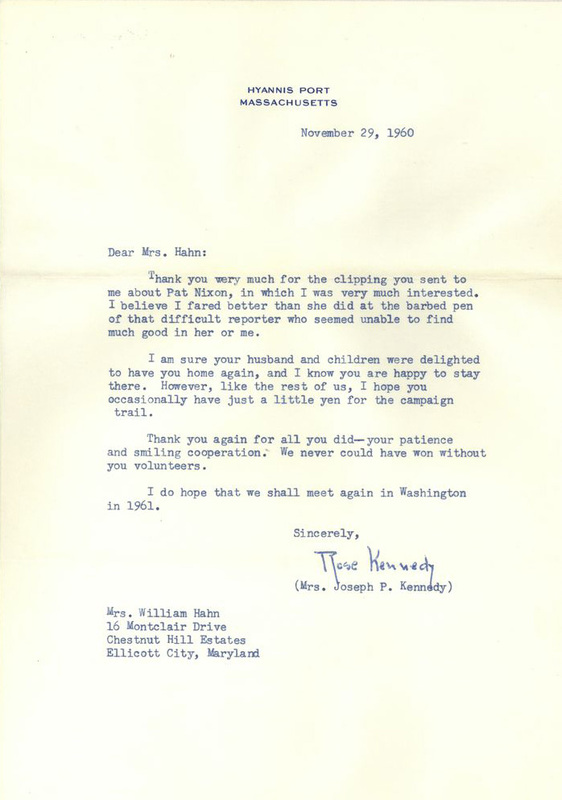 While the collection contained items related primarily to the senatorial and presidential campaigns of John F. Kennedy and Robert F. Kennedy, there were a few objects that just didn’t quite fit with the rest. For example, contained in these papers was a road map of the state of Illinois. While I could infer from related materials that this was used during Hahn’s work on the 1960 presidential campaign, I could not include it in that series. There was no clear indication on the object itself that suggested this use and as a result I placed it in the General File. Several times I was faced with decisions like this; and it was only with the help of some more experienced archivists that I was able to create a logical series list. Shoe repair receipt for John F. Kennedy. View digitized folder here. I was also a little uneasy about discarding newspaper clippings. As an archivist and lover of old documents, it was tempting to keep everything that the Library accumulated. After talking with others, I soon realized that many newspapers are available in a number of other places and that it simply wasn’t necessary to keep them here as well. Instead, I scanned all the originals for online viewing and photocopied them on archival paper, which will hold up better over time. The digitized materials will eliminate the need for researchers to handle fragile documents and allow them to access information remotely. Newspaper clipping, Rose Kennedy campaigns for John F. Kennedy in Xenia, Ohio. View digitized folder of material here. Removing valuable materials was also an interesting part of processing this collection. 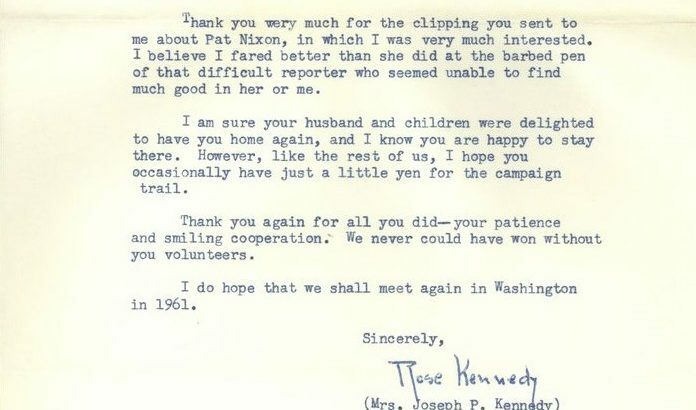 Margaret Ronayne Hahn had several examples of correspondence with members of the Kennedy family in her personal papers, including letters of appreciation from Rose and John for her help on the 1960 presidential campaign, and thank you notes for her condolences on the loss of both John and Robert F. Kennedy. In order to ensure the safety of these materials, I photocopied the originals and replaced them in the open folders. I then created parallel folders to house the original materials. These items will be stored separately to guarantee their safekeeping. 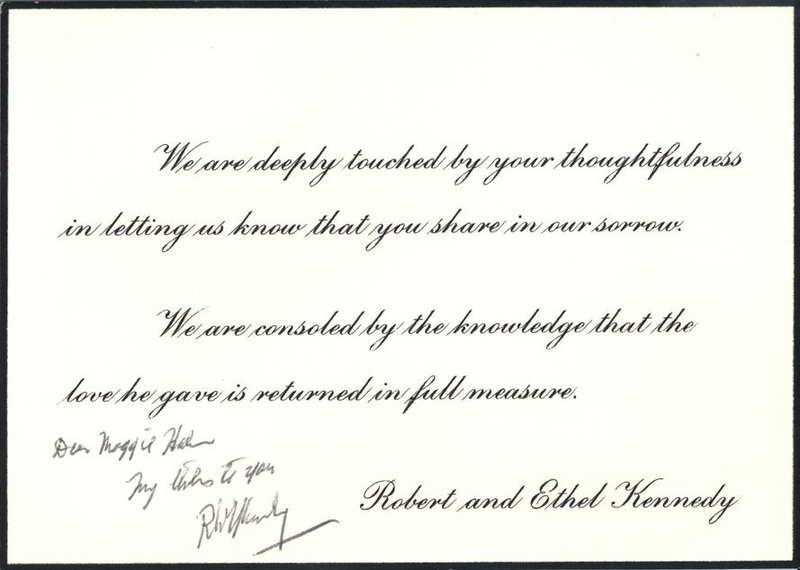 Thank you note signed by Robert F. Kennedy to Margaret (Maggie) Hahn. View digitized folder of material here. Thank you note signed by Rose Kennedy to Margaret (Maggie) Hahn. View digitized folder of material here. The biggest challenge I found when engaging in this project was simply finding a space to accommodate all my roles. I needed a computer capable of accessing the DAMS, the Kennedy Library website, and the shared drive where materials and templates that document processing and scanning decisions are stored. Unfortunately, the computers that are currently set up to scan do not have this capability. I found myself switching between available work stations when I needed to create transfer sheets or document over-sized items. It was also difficult finding physical space to label and re-folder materials. A larger table or desk would have been an improvement and limited the amount of piles that accumulated around me. Overall, though, these problems were very minor and the entire experience went quite smoothly. After completing digitization and finalizing the description, the finding aid to the Margaret Ronayne Hahn Personal Papers was published online. It can be found here. I found the experience to be incredibly useful and I hope the Kennedy Library extends it to future interns. It was beneficial to see the entire process, from processing to web publication, and gain a better understanding of what goes into making a collection available. I scanned photographs and consulted the Audiovisual Reference unit on sound recordings, reviewed donor records, and wrote a finding aid–all skills that I would not have otherwise gained. I value what my colleagues and peers are working on, and appreciate their hard work each step of the way. Working on the Margaret Ronayne Hahn collection has also reaffirmed my excitement for the profession. There are fascinating materials hidden in collections all over and we in the archival profession can share them with the world. Thanks for posting these. Maggie Hahn was my great aunt and I’d hear alot about her campaign adventures when I used to visit with her on weekends. This really does bring some of her stories home for me. Thank you so much for sharing this comment with us; it is very heart-warming to hear! You may also find audio recordings of your great aunt talking about her campaign experience, below. Enjoy!